„Welcome to Rome“ is a brand new and great attraction in Rome that has been around since 2017. It is a multimedia show about the 2700 years history of the city of Rome in a converted former cinema. In addition, state-of-the-art technology is used, a mixture of film, 3D, modern technology of projections and real models of buildings. The show „Welcome to Rome “ consists of 2 parts. On the one hand there is a screening in a room, similar to a cinema (duration about 30 minutes). On the other hand, in 4 further small rooms there is a demonstration about 4 well-known buildings in Rome: St. Peter’s Basilica, Temple of Mars, Imperial Forums and Sant Angelo Castle. These small shows last about 4 to 5 minutes each. In total you are about 1 hour in the show „Welcome to Rome“. In this rather inconspicuous building is the „Welcome to Rome“. In the big screening there is not only a screen like in a cinema. The images, as of antique buildings, are also on the wall and floor. A large city map is also faded in almost all the time. Above all, Rome in antiquity is shown as it once looked. Those who visit afterwards the big excavations as Forum Romanum or Colosseum will see the Eternal City in a completely different way. We liked „Welcome to Rome“ extremely much. An ultra-modern multimedia demonstration that uses everything that has the latest technology to offer. A journey back in time to ancient Rome and through the long history of the city. Ideally one should visit „Welcome to Rome“ at the beginning of the city trip to Rome. The staff was very helpful and friendly during our visit. Every visitor gets headphones. Everybody listens in their own language, of course there is also German. The thing is an idea of Paco Lanciano, a physicist known in Italy, who has made many scientific broadcasts on television. Our conclusion: Let’s hope that there will soon be similar shows in other big tourist cities around the world. „Welcome to Rome“ is really a great animation! A great start for a trip to Rome. But also people who have often been to Rome like the presentation about the history of the city. We hardly discovered anything negative: There are some mistakes in the presentation, maybe only in the German version. For example, the dates before Christ and after Christ were confused. Also the entrance is not necessarily inexpensive (see below). 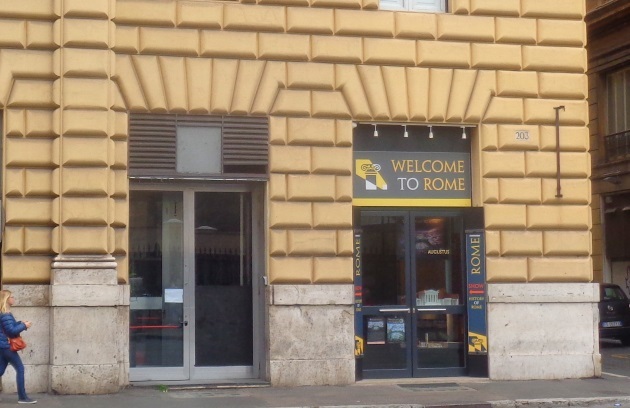 But you should keep in mind that Welcome to Rome is a private company that lives from the entrance fees. The show about the history of Rome in the form of a journey through time costs 12 Euro entrance fee. Children between the ages of 6 and 14 pay a few euros less, smaller children are free. You can buy tickets in advance for „Welcome to Rome“ on the Internet. This can be useful as there are not too many seats in the converted cinema. This can lead to queues. A small advance booking fee is added to the online tickets for Welcome to Rome. Monday, Tuesday, Wednesday, Thursday: 9 a.m. to 7 p.m.
Friday, Saturday and Sunday: 10 a.m. to 9 p.m. The big show starts every 30 minutes, the 4 small ones every few minutes. You can watch the big show first or some small shows first, depending on when the next big show starts. So you don’t have to come on the hour or anything like that. The show „Welcome to Rome“ is near the Piazza Navona in the heart of the city. Unfortunately there is no metro nearby. From the main station Statione Termini you take for example the bus 64 (departure about every 7 minutes, journey time 15 to 20 minutes). Nearby are the already mentioned Piazza Navona, the market Campo de Fiori, the ancient Pantheon and, only about 100 meters away, the big museum Museo di Roma.